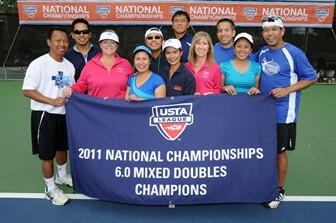 6.0 Mixed Doubles National Champions - USTA Northern California, Roseville, Calif. (L to R): FRONT ROW: Mark Mapeso, Pamela Todd-Johnson, Rizza Bongosia, Jesusa Flynn (captain), Cheryl Dyok, Karen Caracut, Norman Luque. BACK ROW: Carlito Caracut, Emedo Ortiz, Joel Illustrisimo, Darrell Dela Torre. NOT PICTURED: Karen Graham. Tucson, Ariz. - The USTA Southern Section 10.0 team, the USTA Pacific Northwest Section 8.0 team and the USTA Northern California Section 6.0 team were crowned champions at the 2011 USTA Mixed Doubles National Championships, held Nov. 18-20, at the Jim Reffkin Tennis Center. The 10.0 Southern team from Savannah, Ga. defeated the Mid-Atlantic representative from Washington, D.C. in the championship match, by a score of 2-1, in a contest which came down to a tiebreaker on the final court. Saturday afternoon, the Southern group defeated a team from the Southwest Section in the semifinal round. The Southern team is captained by Daryl Bondurant, and features Tammy Zawacki, Ivor Savage, Brandi Cox, Victor Ventura, Maria Primatic and Paul Thoesenand plays at the Southbridge Racquet Club. At the 8.0 level, the Pacific Northwest team, from Mill Creek, Wash. defeated the group representing the Florida Section, from Pinecrest, by a 2-1 score in the finals. In the semifinals, the Pacific Northwest group defeated a team from the Midwest Section. The Pacific Northwest team is captained by Kent Van Alstyne, and features Bruce Dayton, Justin Tran, Erin Link, Alex Mathers, Kyle Stalker, Lisa Lincoln, Rob Box, Sonja Pemberton, Anne Corsano, Brita Nelson, Matthew Look and Allison Porter. The team plays at the Mill Creek Country Club. The 6.0 Northern California team from Roseville completed an amazing come-from-behind victory in a tiebreaker in the championship contest, defeating the Southern Section team from Knoxville, Tenn. to capture the title. The Northern California team is captained by Jesusa Flynn, and features Darrell Dela Torre, Joel Illustrismo, Pamela Todd-Johnson, Karen Graham, Emedo Ortiz, Mark Mapeso, Norman Luque, Rizza Bongosia, Karen Caracut, Carlito Caracut and Cheryl Dyok. The team plays out of Mahany Park. Third place for the 10.0 teams went to the Southwest Section, which defeated a team from the Missouri Valley Section in the consolation match. The Mid-Atlantic Section 8.0 team picked up third place with a victory over the Midwest Section. The Caribbean Section finished in third place at the 6.0 level, with the Eastern Section representative finishing fourth. This year’s USTA League Mixed Doubles National Championship has drawn the top 44 teams (12 10.0 teams, 16 8.0 teams and 16 6.0 teams) from throughout the nation.